He of the ever-changing facial hair and little else–that’s Michael “Serpenthead” Chertoff to you–finally has a plan to get experienced people in top positions at the Department of Homeland Security . . . at the END of the Bush Administration. Wow, it finally dawned on him. Today’s Wall Street Journal details Chertoff’s plan to make us “safer” than we’ve been during his entire tenure at Homeland Security by actually picking experienced career people in political appointee positions for the time between the outgoing Bush administration and the Hillary Rodham Cankles Administration (let’s face it, she’ll be Prez-ette). Chertoff has decided, that although a valley girl from a Kansas City mall has been running Immigration and Customs Enforcement (into the ground) for over two years, it’s now time to pick experienced people for the several months that no-one will be in place to run things. Chertoff claims that the early part of an administration is the most dangerous time because that’s when terrorist attacks occur and there’s no-one to “take charge.” Hmmm . . . If I were an illegal alien or a terrorist, I’d beg to differ. I’d say that the last 7 years have been the most dangerous time, especially AFTER the terrorist attacks, when this administration spent years doing all it could to cooperate with Islamist forces in not enforcing immigration laws against them and in inviting them to dinners, banquets, and soirees. But Chertoff believes we are so safe right now that we must find adequate replacements to hold down the fort when Immigration and Customs Enforcement (ICE) Chieftess Julie Myers a/k/a “The ICE Princess” decides to finally raise her kid and quit doing her nails at a desk at the CAB building. PUH-LEEZE. Can you see The ICE Princess telling a real cop how to play “Cagney & Lacy”? Or Emilio T. Gonzalez (head of Citizenship and Immigration Services)–a man who knows nothing about immigration benefits except giving awards to himself as best immigrant–giving an “exercise” to someone who actually knows how to adjudicate who should and should not get further checks into their background? Oh wait, he fired all of those people. The only “exercises” these people know is on a Stairmaster. Well, not sure about the gym part with Gonzalez. What’s really going on here is the incompetents appointed by Bush and Chertoff actually trying to pick who will run the show, long after Bush is out of office. And, sadly, depending on how long it takes for Cankles to appoint her people, they will have succeeded. Incompetent-ette Marcy Forman-Friedman a/k/a “Peppermint Patty,” the horrid ICE Director of Investigations, will probably “run” the show at ICE for months. Ditto for incompetents like ICE Director of Detention and Removal Operations, John Torres, who spends thousands of ICE money on self-promotion conventions and speeches by “immigration expert” Tommy Lasorda, instead of on apprehending and deporting illegal aliens. I’d say they were already “left to [their] own devices” at the Halloween party. And they were rewarded for it with zero punishment. Yep, that’s who you want training your new Homeland Security temps. Good luck, America. Mazel Tov, illegal aliens and terrorists. Michael Chertoff just picked equally incompetent replacements for those who were supposed to enforce the law against you for the last 7 years. I think he KNOWs we’re not safe, not only that, but he and his demon cohort are making sure, WE’RE NOT. We’re being sold down the river. Betrayed. And our bodies handed to the islamics on a silver platter. 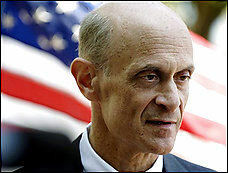 However, Chertoff has his own special team of crack sniper guards, so what the HELL does he care about the rest of us! He’s after all, one of the Elite. Who will retreat into the snake tunnel to hide in, along with Cheney, who has made sure there is an underground bunker (see the blatant underground explostions at Cheney’s mansion), when The People wake up, and the Shift hits the fan! Hillary won’t win the election, and may not even get nominated. There just aren’t enough angry white women over 60 who wish that they had abortions instead of kids, so that they could have fulfilled their hippie chick destiny. Kerry turning on her is only the beginning. The Clintons are hated even within the Dem party. All that happened was that the Team D faithful rode the bandwagon from 1992-2000. A popular president would *never* have been impeached. Oh yeah, and speaking as a boomer, people outside the cohort hate baby boomers. Hell, I’m *in* the cohort and I hate us! career people — are these like the career people in the State Department that have done everything wrong since recorded history? The bureaucrats in all Government bureaucracies have as their aim to retain power. Everything else is subordinate. This means no change in (disastrous) policies unless public pressure is so immense and sustained that they have to do something. People with initiative and a desire to do the right thing do not gain decision-making authority in such an environment. The career people who rise to the top are those who have gone along with things as they are. Aside from the clowns that you mention, these are the type of people who will gain responsible positions. He is probably trying to protect his friends against a housecleaning from the next administration (not that I’m saying anything positive about a future housecleaning — one bad alternative or another). The question hasn’t been raised, so allow me; what happened to the inside scoop that made visiting your site such a guilty pleasure? Which HQ puke got moved on that was feeding the inside story from the Assistant Sec’s Office? 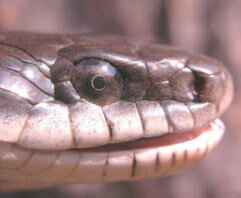 On another happy note: Kerry is a back stabbing self-promoting slime bag. Thank G-d less than the necessary votes were placed for Bush and Kerry didn’t get elected Screw you Kerry! When it comes to victims of crime, what difference does the idiot in charge make? Stop trying to serve yourself and think about the people depending on you to do our job! Myers is not the problem, and either is the Forman, a whole new logic needs to be brought forth; and that needs a major purge at the a– kissing petty bureaucratic middle management level! Chertoff is a fool. A vicious beauraucrat that prefers his perks to the safety of the nation. I frankly believe this idiot is incorrect of making a single correct decision. code7: That is precisely the problem. Myers, Forman, Gonzalez, Chertoff, and the rest are just interim players in the great, fellatic cesspool known as beltway management. It’s been that way since the creation of man and won’t change until it starts at the VERY TOP; from the 1600 Pennsylvania Avenue on down. Don’t look for that to show at a theater near you anytime soon. As far as Cankles winning the WH, I don’t see it happening. She may pull off the Democratic nomination but that’s where it ends. Too many people know what her true character is and Willy isn’t doing her any favors either. This whole ICE debacle is an ongoing nightmare and the only light at the end of the tunnel is the oncoming train. I’m eligible to retire right now but I’ll hang on long enough to see how far it goes down the tank and then I’ll pull the pin. G*d help anyone with time to go in this outfit. Watch the morale dip to new lows folks!